Ben K. Rises With the Apes!!! ‘Rise of the Planet of the Apes’ Review!!! I can’t say I was ever a big fan of the Planet of the Apes series, and I certainly wouldn’t claim to have enjoyed Tim Burton’s misguided 2001 remake of the 1968 original. Having said that, I think there were some interesting ideas and the occasional burst of exciting storytelling in the five year (1968-1973) franchise. The first, starring Charlton Heston and directed by Franklin J. Schaffner (of Patton fame), was definitely the crown jewel. The best compliment I can pay Rupert Wyatt’s 2011 series reboot, Rise of the Planet of the Apes, is that I think the crown jewel is still to come. Don’t get me wrong, I really enjoyed Rise. I had a blast in that theater, frankly. It was one of those rare summer movies where I felt no urge to wear earplugs or roll my eyes. It was neither an assault on the senses nor an insult to human intelligence. There were flaws, certainly, including some flat acting (I’m looking at you James Franco) and some dull characters. For the most part though, this movie was incredibly successful at what really mattered: making its audience want more. Those who have seen 1972’s Conquest of the Planet of the Apes will notice some similarities here, including the “hero ape” being named Caesar. That film was rather silly though, what with the apes becoming slaves after a disease eliminates the world’s cats and dogs. In Rise, we begin in a more believable reality where pharmaceutical research is carried out on chimps. The brains of the operation, Will Rodman (Franco), is motivated by his father’s (John Lithgow) Alzheimer’s disease; he wants to find a cure. Unfortunately, all hell breaks loose during the very board meeting at which Will intended to shock the world with his discovery. The smartest chimp, her intelligence enhanced by Will’s super drug, has to be gunned down in front of all the would-be investors. Needless to say, this doesn’t go over very well with Will’s money grubbing boss, Steven Jacobs (David Oyelowo), who sentences the rest of the chimps to death. As it happens, the female chimp that went ballistic had just given birth and was merely protecting her baby. Will decides to save the baby chimp, taking it home and raising it. 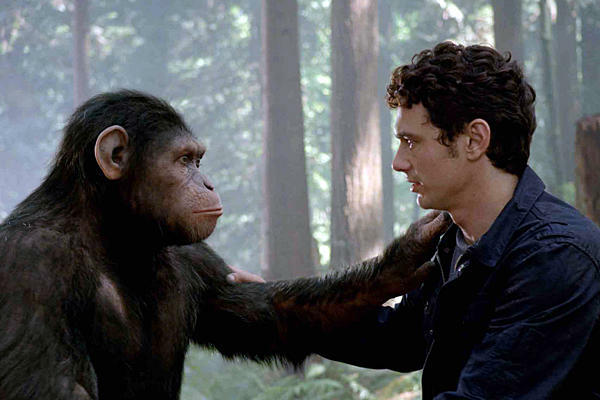 Years pass, Caesar (Andy Serkis, giving the best performance in the film) grows larger, wears sweats, and acts like a rambunctious, hairy child. His mother’s enhanced intelligence has also made its way into his DNA. All is well, until Caesar violently defends a member of his human family, terrifying the entire neighborhood. He is sent to a dirty facility housing a number of apes, including chimps, orangutans, and gorillas. Rather predictably, he is treated horribly by Draco Malfoy (sorry, Tom Felton), sporting an American accent. Among his own kind, Caesar begins at the base of the totem pole, before eventually rising up and gaining the respect of the others. 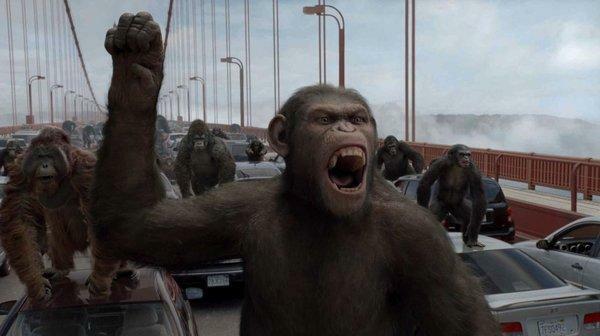 Thanks to the trailers, I’m not giving away much when I say the apes revolt (aided by a more potent version of Will’s drug), leading to a pretty exciting, action-packed climax through the city of San Francisco. The computer animation and motion capture work by WETA (Lord of the Rings, King Kong, Avatar) is world class throughout, arguably the best they have done to date. Andy Serkis deserves some kind of award for bringing Caesar to life, this is greatest effort since Gollum. As I mentioned, it’s predictable at times, with several wasted characters (Freida Pinto has nothing to do), but Rise still emerges as a satisfying summer movie. By the end I found myself wondering where the next film will take us. Perhaps an all out war between the apes and humans? When will Cornelius come into the story, and will he still be Caesar’s son? In 1973’s Battle of the Planet of the Apes, Caesar desires peace between the humans and apes, while a character named Aldo wants all the humans dead. One of the apes in Rise is particularly villainous, and I smell a similar conflict coming in the sequel between he and Caesar. In short, I’m excited about what the future holds for the series, and Rise deserves a lot of credit for stoking that within me. Go Banana’s for the “Rise of The Planet Of The Apes” Trailer!!!! Film Review: ‘Dawn of the Planet of the Apes’!! 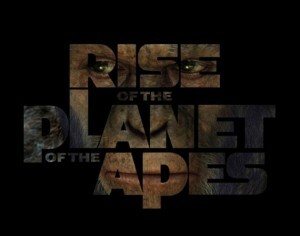 New ‘Rise of the Planet of the Apes’ Trailer Is Here!!! Looking Great!!! This entry was posted on Monday, August 15th, 2011 at 10:59 pm	and is filed under Film, News. You can follow any responses to this entry through the RSS 2.0 feed. You can skip to the end and leave a response. Pinging is currently not allowed.